Children’s Church started in August 2017. As Kirby Darden, the Director of Children’s Ministries, gears for up the second year, you may wonder what happens each Sunday when Kirby and the children (ages 3 through third grade) leave the sanctuary for Children’s Church. Why are the kids (and parents) so excited to leave? And, what are they doing down in the Chapel? The kids are learning to worship through age appropriate songs and dances. They hear the message in a video. They are learning and reciting the Lord’s Prayer. 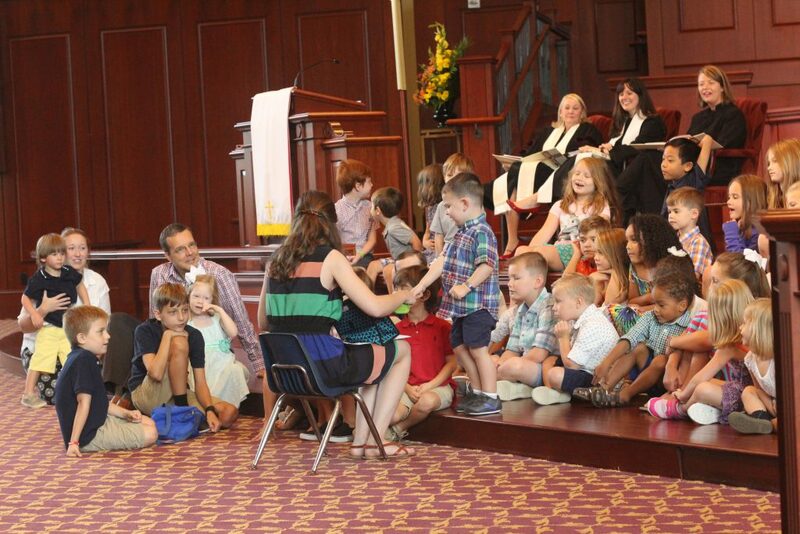 Collecting an offering and participating in communion are two other activities during Children’s Church. The last part of Children’s Church is a craft or activity that extends the Bible lesson. Some kids, parents, volunteers, and Kirby answered some other important questions about Children’ Church. Why do the kids love it? Why do parents love it? Why do the volunteers love it? What’s Kirby’s favorite thing about Children’s Church? Children’s Church helpers, especially on a “substitute” basis. We have wonderful volunteers who help on a once-per-month rotation, but the biggest need is adults who would be willing and able to jump in and help the kids at the last moment. If you are interested in volunteering on a regular basis or a substitute basis, please contact connect@johnscreekumc.org.